In public health, biofilms aren’t Ashton Kutcher acting in a movie about Steve Jobs! 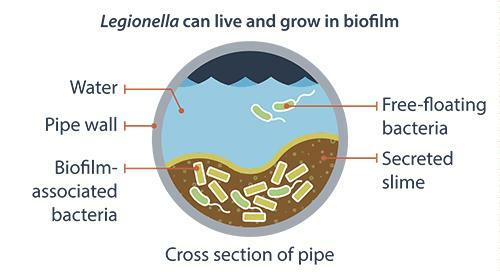 While definitely not as glamorous as a Hollywood film, biofilms are extremely important- especially in the spread and amplification of Legionella, as well as other waterborne pathogens. A biofilm is a slimy substance in which bacteria stick to each other and to their surrounding surfaces. That rough, “fuzzy sweater” feeling on your teeth the morning before you brush is biofilm. 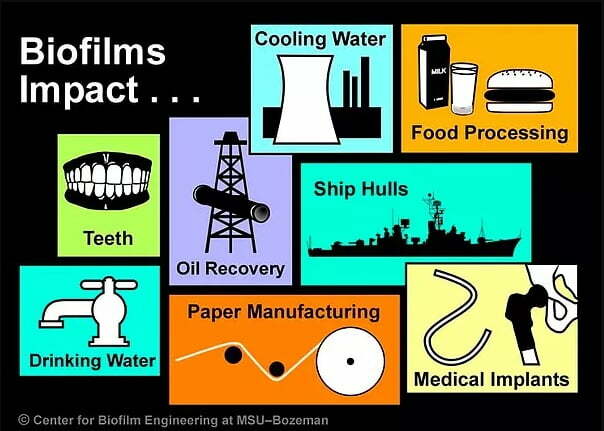 Biofilm is also that “skin” on the surface of a glass of water that has been left out overnight. That soft green carpet growing on rocks in rivers and ponds is … yup, you guessed it- it’s biofilm! Scientifically, a biofilm is an assemblage of microbial cells that is irreversibly associated (not removed by gentle rinsing) with a surface and enclosed in a matrix of primarily polysaccharide material, known as an Extracellular Polymeric Structure (EPS). Noncellular materials, such as mineral crystals, corrosion particles, clay or silt particles, or blood components, depending on the environment in which the biofilm has developed, may also be found in the biofilm matrix. Biofilms only grow in wet areas. The faster the moving water is, the thinner the biofilm. Conversely, the slower the moving water, the thicker the biofilm. For a bacterium or other microorganism, such as amoebas, protozoans and algae, living as part of a biofilm has its advantages. Bacteria living as a group (e.g., biofilm) are more resilient to stressors, such as dehydration, ultraviolet light, high or low pH or to the presence of bacterial toxic substances, such as antibiotics, antimicrobials, disinfectants or heavy metals. Unfortunately, for waterborne pathogen control, it is this biofilm which makes it difficult for public health officials and water technologists to kill and prevent the amplification of harmful bacteria, such as Legionella. Within the biofilm itself, the protozoa play a crucial role in the life cycle of Legionella as they provide a habitat for environmental survival and reproduction. They also serve as a protection from biocides and other stresses. Thermotolerant amoebas also serve as a habitat for Legionella within biofilm which may provide another protection against heat treatment. Although biofilms are relatively difficult to remove from surfaces, especially inside plumbing of water distribution systems, any disturbances in a water distribution system, such as water main construction or maintenance, a burst pipe or an explosion, can shake the biofilm loose. The freed biofilm and/ or plume of contaminated water travels in the water column downstream to seek out a new home. When another surface is found, such as new plumbing systems or newly installed evaporative cooling towers, the biofilm re-establishes, thus “seeding” the new plumbing system. Preventing the formation of biofilm has been one of the public health and water treatment strategies for reducing water system contamination and therefore reducing the number of people who contract Legionnaire’s and other water borne diseases.